Description: Northbound BNSF 4511 leads an intermodal on Track 2. 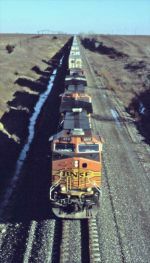 Description: Three BNSF DASH-9's lead a pig train south. Description: Q141 (left) passes Q215 at track speed at Rupert, GA. Description: BNSF/HLCX/WC make up the consist for today's Q215 pulling off the double track at Rupert, GA. Description: Quartet of Dash 9's head East at Higgins, TX with a lone Warbonnet as third unit. Description: Actual location is Crale. Description: The Amarillo - Denver manifest picks up speed as more of it's 7,702' train has crested the Palmer Divide. Description: A trio of Dash 9s lead the AMADEN northbound out of Palmer Lake. Description: A short west bound manifest crossing the Mississippi River.